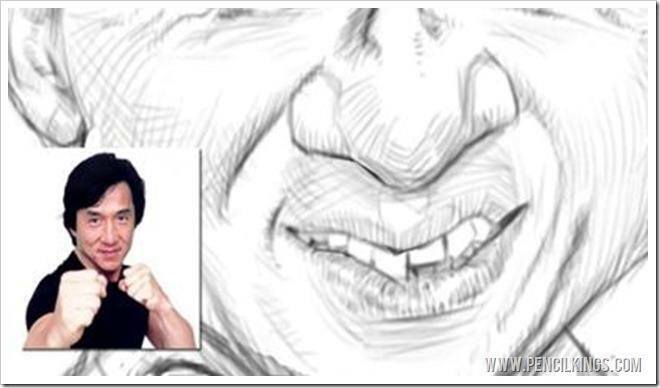 In the previous lesson on how to make a caricature in Photoshop, Sycra Yasin showed you how to experiment with possibilities and combine different reference photos of celebrities to create a thumbnail sketch for your caricature painting. 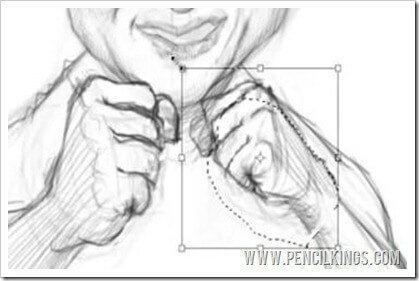 In this chapter, he’ll demonstrate how you can build upon your thumbnail sketch to create a refined sketch as a basis for your fully-rendered caricature painting. Whereas creating a thumbnail sketch was all about freedom and working quickly to explore lots of possibilities, the refined sketch stage is a more detailed and lengthy process. Here, you’ll be working much more slowly and really concentrating on all the details. And, along the way, you’ll be picking up some professional tips from Sycra and learning how you can use these to build up an epic portfolio of caricature paintings and other artwork. 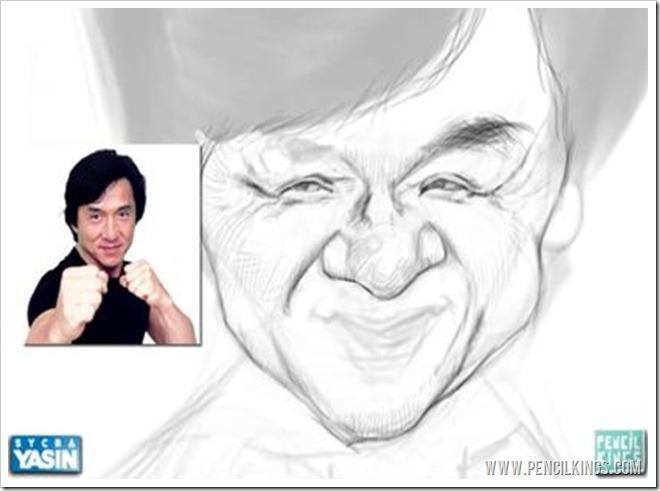 So, let’s get ready to learn how to make a caricature in Photoshop and get some awesome results! 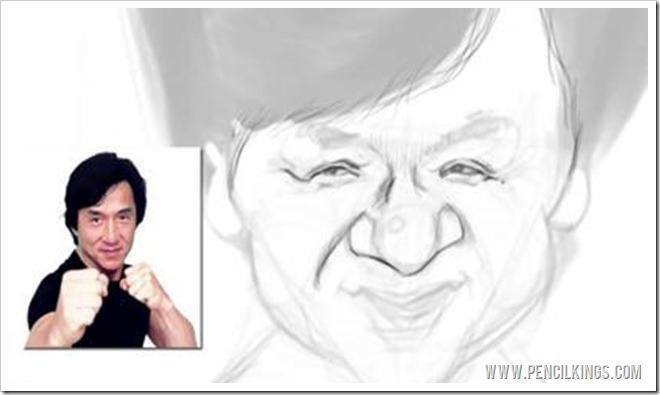 During the thumbnail stage, you were working quickly and freely to develop a whole series of rough sketches to form the basis for your caricature. Composition is one of the most important stages in learning how to make a caricature in Photoshop. So, once you’ve established your composition, it’s time to move on to the refined drawing stage – a much more detailed process where you’ll be concentrating at all times to create a stunning likeness of your subject. Take your time and work at a pace that suits you – when learning how to make a caricature in Photoshop, this stage is all about refinement and building on a solid thumbnail image for an awesome final result. To begin work on your refined sketch, first duplicate your thumbnail sketch onto a new white layer and then create another layer on top to start drawing. 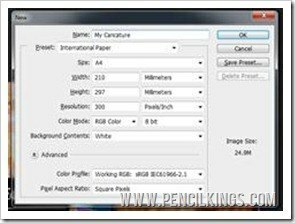 When studying how to make a caricature in Photoshop, choose a high resolution for your artwork by creating a new file and selecting International Paper from the Preset options. This will automatically create a new document in A4 size which will be at the high resolution needed for finished artwork. Alternatively, create a new file, change the resolution to at least 2000 x 2000 pixels and you should be fine. Once you’ve created a new layer, you can then start drawing on top of your thumbnail image. However, rather than simply tracing what’s underneath, you should try and use your thumbnail sketch for placement and develop your refined drawing using your reference photos. Zoom in, slow down and really try to notice small details in the eyes, nose ears and mouth. This stage is all about careful observation and those tiny details that can make a big difference to your finished artwork. Although you’ve exaggerated the shape of the face, it’s important to remember that the framework stays pretty much the same. 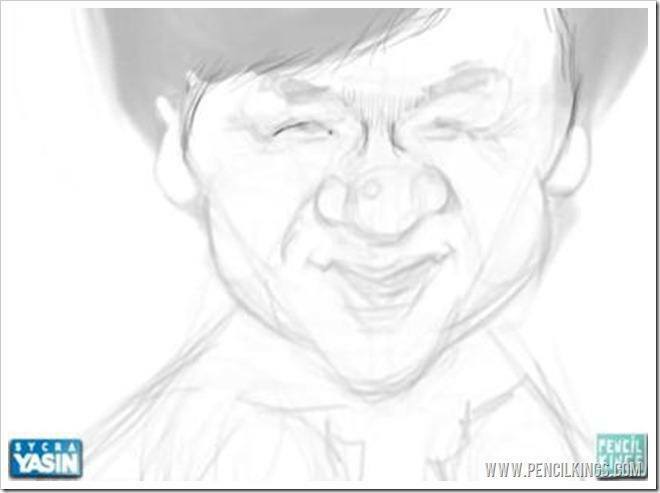 For example, you can see here how Sycra is drawing the eyes based on what he sees in the reference photo of Jackie Chan. Remember the earlier chapter on relationships between features? This stage in learning how to make a caricature in Photoshop is a prime example of this. Although some features have been exaggerated, you still need to consider the relationship of the eyes, forehead and other facial features to create a great likeness. When shading his drawing, you’ll notice Sycra uses cross-hatching to follow the forms of the face and go across it. Using this technique will enable you to create a realistic, 3D feel where the features really stand out. Try and think about the forms you’re drawing and represent these using a series of short, directional pencil strokes. Imagine a cardboard tube or cylinder lying horizontally – if you followed the form, you’d be drawing a series of lines running left to right, but if you went across the form, you’d be drawing lines that ran up and down and followed the curve of this cylinder. Whichever way you choose, be sure to look at your reference photos to give you a better idea of how each form should be represented. Creating a great caricature is about more than being able to draw well. It’s a question of developing a solid thumbnail sketch and then building upon this to create a highly refined drawing which can then be rendered. This is something that will come with practise and it will take time to perfect. When studying how to make a caricature in Photoshop, try and think about how you perceive your subject – what is it about them that stands out for you? In fine art portraiture, students are often told to only paint what they can actually see. In other words, your opinion of the subject doesn’t feature. 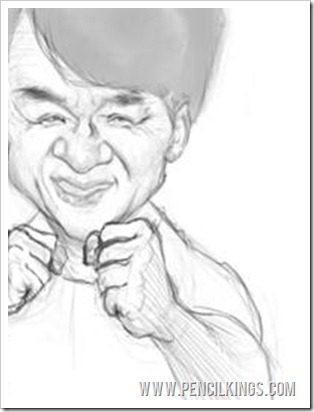 However, when learning how to make a caricature in Photoshop, the reverse is often true. A successful caricature portrait depends upon you capturing the spirit and personality of your subject according to your personal view of them. It’s very much a balancing act between reality and how you personally see your subject. Keep studying your drawing closely and ask yourself whether it represents how you feel about your subject. If you feel they have large hair or a big, round nose, then go right ahead and draw it – just remember not to lose track of reality and keep checking your reference photos. During the refined sketch process of studying how to make a caricature in Photoshop, you may find you need to alter certain elements of your drawing so they work better. 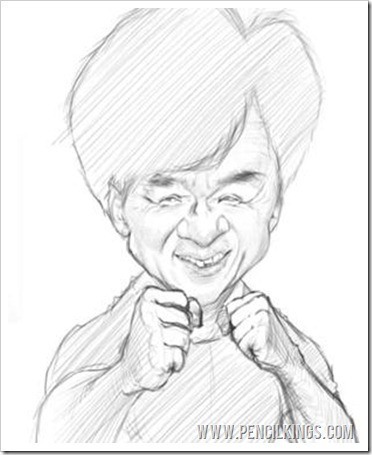 Here, you can see how Sycra has decided to make Jackie Chan’s clenched fist bigger so it’s in proportion with the rest of his drawing. You can do this easily by using your Polygonal Lasso Tool to draw around any areas you wish to change, and then hitting Ctrl + T to transform them quickly by making them smaller or larger or rotating them. Another useful technique when mastering how to make a caricature in Photoshop is to flip your canvas from time to time to get a different view on your drawing. To do this, go to Image > Image Rotation and select Flip Canvas Horizontal. Using this method will highlight any areas in your drawing which you may not have noticed before. Remember to slow things right down and take your time to get all the elements of your drawing right. Concentrate, look closely and really try to nail your subject’s personality. All the subtle characteristics you notice will really help transform your drawing from a good likeness into a caricature with the ‘wow’ factor! Keep looking around your drawing and don’t be afraid to make changes if necessary. 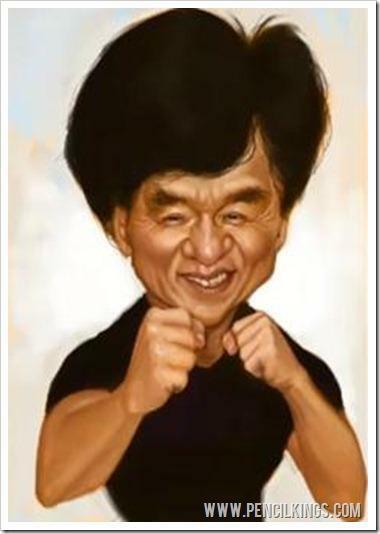 After all, you’re the artist here and it’s your decision about how this caricature should look! Don’t get too Detailed With Dentistry! There’s no need to go into too much detail when drawing the teeth. So, rather than spending time drawing each individual tooth, try and think more about the general forms and simply suggest shapes rather than stating them explicitly. The refined sketch stage is all about placing features accurately and providing you with a sold base upon which to paint. In the next lesson, Sycra will be showing you how to add color values and form and it’s here that you’ll be able to take these less well-defined areas such as the teeth and work them up into an amazingly lifelike end result! We hope you’re learning a lot and that this series has inspired you to learn more about how to make a caricature in Photoshop. We love hearing from you, so don’t be shy – leave us a comment in the box below!